Cytomegalovirus (CMV) was first isolated from the salivary gland and kidney of two dying infants with cytomegalic inclusion bodies and reported in 1956 (1). Two other laboratories isolated CMV at approximately the same time. Thus, CMV was initially called “salivary gland virus” or “salivary gland inclusion disease virus.” In 1960, Weller et al. (2) proposed the use of the term cytomegalovirus. Klemola and Kaarianien (3) first described CMV mononucleosis, the principal presentation of previously healthy individuals, in 1965. CMV was first isolated in a renal transplant recipient in 1965. CMV is a member of the genus Herpesvirus and belongs to the family Herpesviridae (4). There are eight known human herpes viruses (HHV; Table 1). The HHV are divided further into three subfamilies: the α-herpesvirinae, the β-herpesvirinae, and the γ-herpesvirinae. The α-herpesvirinae include human simplex viruses (HSV) 1 and 2 and varicella zoster virus. The β-herpesvirinae include CMV, HHV-6, and HHV-7. The γ-herpesvirinae include Epstein-Barr virus (EBV) and HHV-8. Morphologically. the herpes viruses are indistinguishable from one another. 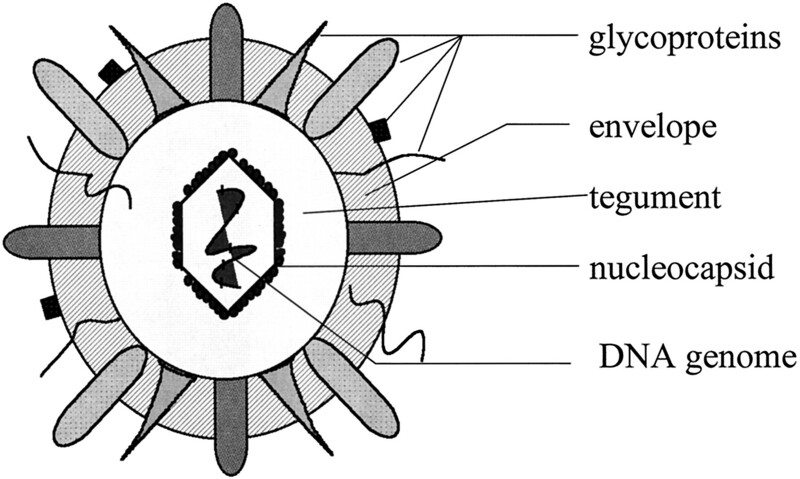 The complete virion is 150 to 200 nm in diameter and icosahedral in shape and consists of an inner core, a capsid, and an envelope (Figure 1). The inner core (genome) of the CMV virus is a 64-nm linear double-stranded DNA molecule. There is little genetic homology between human CMV and CMV of other species. The capsid is 110 nm in diameter and consists of 162 protein capsomers. The envelope contains lipoproteins and at least 33 structural proteins, some of which are glycosylated (glycoproteins). The glycoproteins determine the strain of CMV, are used for cellular entry of the virus, and are the targets of virus-neutralizing antibody. Schematic of cytomegalovirus (CMV). The CMV virus shows a similar composition to all human herpes viruses. CMV is a labile virus and readily inactivated by lipid solvents, pH below 5, heat (37°C for 1 h or 56°C for 30 min), and ultraviolet light for 5 min. It can survive on environmental surfaces for several hours. CMV can be stored at 4°C for a few days without loss of infectivity. Storage at -70°C without loss of infectivity is possible for several months. CMV can be stored at -190°C (liquid nitrogen) indefinitely. White blood cells and CD13-positive cells in particular are the principal reservoir where CMV is harbored (5). It has been detected in most tissues in the body and may remain latent. Virus enters the host cell by fusion of the virus envelope with the cell membrane or via phagocytosis. Infectious particles are first detectable by electron microscopy one to several days after inoculation; however, viral DNA and protein can be detected in the infected cell before viral assembly is complete. Virus particles are made and assembled in the nucleus and attain an envelope by budding through the inner nuclear membrane. From there, the particles go through the trans-Golgi network, where the virus particle becomes pathogenic through proteolytic cleavage of a consensus furin site to form glycoprotein B (gB). Furin was the first proprotein convertase to be identified. It is localized mainly in the trans-Golgi network. This endoprotease is capable of cleaving precursors of a wide variety of proteins, including growth factors, serum proteins including proteases of the blood-clotting and complement systems, matrix metalloproteinases, receptors, bacterial exotoxins, and viral-envelope glycoproteins (6). gB is the CMV UL55 gene product and the predominant human CMV envelope glycoprotein (7). Because defective virus particles are noninfectious, this process of virion formation may be amenable to development of potential vaccines (see below). CMV replication produces immediate-early (IE), early, and late CMV antigens. IE antigens appear in the nucleus of CMV-infected cells 1 to 3 h after infection and remain present even in latent infection. IE antigen gene products direct production of both viral and cellular genes. Early antigens appear in the cytoplasm or membrane approximately 3 h after infection. Early antigen gene products direct viral DNA synthesis. Late antigens appear in the nucleus and cytoplasm within 6 to 24 h after infection. Late antigen gene products direct production of structural nucleocapsid proteins. IE and early antigens are virus-induced nonstructural proteins and appear before DNA synthesis. This is important because the mechanism of action of ganciclovir, foscarnet, and cidovir (the three most common agents used for treatment of CMV) is through interruption of DNA synthesis. Late antigens are virally encoded structural proteins and appear after DNA synthesis, so their appearance is sensitive to the common antiviral agents. Because of this, monitoring late antigen levels may be more relevant than monitoring IE or early antigen levels when assessing response to therapy. The CMV antigens have a number of other effects. The IE gene product upregulates transcription and expression of interleukin-2 (IL-2) and the IL-2 receptor (8). The CMV IE gene also prevents the inhibitory effect of cyclosporine on IL-2 gene transcription (9). It may do this in part by sustained nuclear factor-κB activity and transactivation of promoters containing nuclear factor-κB enhancer sequences. The IE and early antigen gene products also upregulate adhesion molecules such as intracellular adhesion molecule-1 and lymphocyte functioning antigen-3. This upregulation is blocked by ultraviolet irradiation, which destroys viral infectivity. Intracellular adhesion molecule-1 and lymphocyte functioning antigen-3 upregulation is not blocked but actually enhanced with treatment with ganciclovir and foscarnet (10). Thus, CMV infection can initiate endothelial activation and rejection despite effective treatment with ganciclovir, foscarnet, or cidofovir. The CMV virus has developed a number of mechanisms to subvert host defenses. One of these is the ability to downregulate expression of major histocompatibility complex (MHC) class I molecules, which may allow evasion of and recognition by cytotoxic T lymphocytes (11). Human CMV proteins also block transporter associated with antigen processing, retain MHC class I molecules in the endoplasmic reticulum, and recycle nascent class I heavy chains back to the cytosol. Because MHC class I molecules, acting through various receptors, signal inhibitory messages to natural killer (NK) cells, CMV-infected cells (which lack MHC class I molecules) should be more susceptible to attack by NK cells. However, CMV-infected cells express CMV gpUL18, a class I homolog that may allow for evasion of NK lysis of infected cells (11). Recently, another CMV antigen, gpUL40, has been shown to upregulate the nonclassical MHC class I molecule HLA-E. HLA-E inhibits NK cell-mediated lysis by binding to a C-type lectin receptor on NK cells (12). Finally, CMV can also evade eradication by production of a viral IL-10 homolog (13). IL-10 blocks proinflammatory cytokine synthesis and suppresses the ability of macrophages to serve as antigen-presenting or costimulatory cells. Symptomatic CMV infection occurs in 20 to 60% of all transplant recipients and is a significant cause of increased morbidity and mortality in this population (14,15). The incidence may be somewhat lower in kidney transplant recipients who do not receive antilymphocyte therapy, high-dose mycophenolate, or the potent combination of mycophenolate and tacrolimus without adequate antiviral prophylaxis. This wide range in the reported incidence of infection and disease results from the varying intensities of immunosuppression used and the frequency and methods used to detect CMV infection. Historically, concern has focused mainly on avoiding CMV infection in the CMV D+/R- group because this group has been at greatest risk for severe “primary” infection during the first 3 mo after transplantation. However, the indirect effects of CMV infection on graft and patient survival have been increasingly recognized in recent years. Our own analyses of data from the United States Renal Data System and United Network of Organ Sharing revealed that by 3 yr, it is the D+/R+ group and not the D+/R- group that has the worst graft and patient survival (16,17). The reason for this is not entirely clear but may reflect the prevalence of multiple CMV virotypes and that the D+/R+ patients may have a double CMV exposure with reactivation of differing latent donor and recipient CMV. CMV can predispose to rejection as well. Subclinical CMV may also mimic and or predispose to late acute rejection. Late subclinical infections are common and associated with relatively rapid graft loss (18). CMV has been associated with both atherosclerosis and chronic rejection, and the two most common causes of late graft loss are cardiovascular death and chronic rejection. Chronic rejection is also known as chronic allograft nephropathy and is characterized by myointimal thickening, which is a form of atherosclerosis. Latent CMV infection has been associated with a markedly increased rate of restenosis (1200% higher) after coronary angioplasty in non-transplant seropositive individuals compared with seronegative individuals (19). Furthermore, the histologic lesion of coronary restenosis is diffuse atherosclerosis characterized by myointimal hyperplasia resembling chronic rejection. CMV is believed to affect this process in part by blocking the antiproliferative effects of p53 (20). However, more recent evidence suggests that the myointimal increase is not from proliferation but rather from migration of smooth muscle cells (SMC) mediated by virally encoded chemokine receptors that require tryosine kinase for expressions (21). SMC migration could be blocked by tryosine kinase inhibitors and suggests another potential future therapeutic strategy. Finally, human CMV infection may also cause atherosclerosis and chronic rejection by increasing oxidized low-density lipoprotein uptake by vascular SMC (22). This process is mediated by the IE gene IE72 and does not require viral replication, which may explain why angioplasty patients who were infected latently with CMV had higher rates of restenosis after angioplasty. CMV has been associated with several other vascular injuries that may explain why the D+/R+ group has the worst overall survival. One such vascular injury associated with CMV is transplant glomerulopathy. However, the frequency and clinical significance of this lesion are uncertain (23). The lesion of the hemolytic uremic syndrome/thrombotic microangiopathy is one of the more common vascular pathologies associated with CMV and may be confused with or present with cyclosporine or tacrolimus toxicity (24,25,26). CMV-associated hemolytic uremic syndrome/thrombotic microangiopathy may respond to Ig infusion (26). CMV has been implicated as an important contributor to restenosis of coronary arteries after angioplasty in nontransplant patients (19). CMV has also been associated with transplant renal artery stenosis. In a study of more than 900 renal transplant recipients, 75 were diagnosed with renal artery stenosis via angiography (27). Patients with stenosis were paired with a control individual matched for age, gender, year of transplant, and number of grafts, but without renal artery disease. Definitive evidence of CMV infection was significantly associated with stenosis (36 versus 12 control patients; P < 0.001). Thus, the more subtle effects of CMV on vascular biology ultimately may be more important than acute CMV disease itself as a cause of patient and graft loss. There are several methods for diagnosing CMV. The advantages and disadvantages are presented in Table 2. Until fairly recently, the available techniques for diagnosing CMV were limited to histologic identification of CMV inclusion bodies, viral culture, and serology. These techniques are labor intensive and not completely sensitive, and the time from primary infection or reactivation to detection of CMV is protracted, allowing for undetected and untreated disease progression (28). In addition, transplant recipients may fail to produce an antibody response despite other evidence for viremia, making the newer techniques preferable to serology for detection and monitoring. Newer techniques include shell vial culture, pp65 antigenemia assay, PCR, and the hybrid-capture RNA-DNA hybridization assay, which has recently received FDA clearance for the qualitative detection of CMV-DNA (28). Two even more recently developed techniques are the branched DNA assay and the nucleic acid sequence-based amplification, which amplifies large quantities of RNA (28). The clinical utility of both of these tests in renal transplantation remains to be determined. The CMV-PCR uses DNA that does not deteriorate and is not diminished with storage. Both the shell vial and pp65 antigenemia assay do deteriorate rapidly—even within a 6-h delay of processing the sample (29,30). Thus, qualitative CMV-PCR of buffy-coat specimens is the monitoring test of choice at our institution (29,30). Quantification of CMV in blood, plasma, or other body fluids may aid in (1) the identification of patients who are at highest risk for developing CMV disease, (2) determining when to terminate therapy, (3) the evaluation of new therapeutics, and (4) the prompt recognition of drug-resistant CMV strains. The shell-vial, pp65 antigenemia assay, PCR, and hybrid-capture assays all are amenable to quantification (26). The total burden of CMV in the host may correlate with clinical evidence of disease, disease severity, or response to therapy (31,32). Unfortunately, the quantitative shell-vial and pp65 antigenemia assay have several relative disadvantages: (1) lability of the pp65 antigen imposes strict handling requirements for accurate quantitation; (2) failure of a proportion of leukocytes to adhere to the microscope slide can affect the accuracy of quantitation, and current methods do not evaluate the actual number of cells examined; (3) range of values detected is relatively narrow; and (4) quantitation by the antigenemia assay is laborious and potentially subjective because it requires counting of antigenic foci by microscopy (28). The amount of CMV particles, as determined by quantitative PCR, and its correlation with clinical illness have been analyzed as part of a study of 25 renal and 95 cardiac transplant recipients (31). All patients with CMV DNA levels of >500 copies/μg of total DNA in peripheral blood had clinical evidence of disease, although some with lower viral burdens were also symptomatic. Because PCR results may vary significantly by laboratory, the general application of this technique requires further standardization and study. Other techniques for CMV quantification have not been systematically studied in renal transplant recipients. At present, quantification of any of these techniques is probably useful only in clinical trial settings and not applicable to the routine management of patients. Thus, the optimal test for the diagnosis and management of CMV is unknown. I believe that currently PCR should be the test of choice for the diagnosis of CMV, as long as the result is interpreted appropriately with respect to the clinical situation (30). Multiple strategies have been used to reduce the morbidity and mortality of CMV infection and its associated costs. These strategies include avoiding CMV sero-mismatching, i.e., D+/R-, therapeutic treatment of established disease, preemptive, and prophylactic strategies. Although practiced at some centers, avoiding CMV sero-mismatching through organ allocation is not feasible or worthwhile on a large scale (16,17). Therapeutic treatment of established CMV disease is primarily with the antiviral agent ganciclovir. Ganciclovir effectively treats CMV-infected cells that contain a phosphokinase that is a product of the CMV UL97 gene. This protein is capable of phosphorylating ganciclovir into an active moiety against CMV, EBV, and HSV (33). By comparison, acyclovir has very limited activity against CMV. This is important because HSV lesions may indicate contemporaneous CMV or EBV reactivation that could be prevented by and must be treated with ganciclovir rather than acyclovir (34). Ganciclovir 5 mg/kg intravenously every 12 h for 21 d is effective for retinitis and sepsis, but it is less efficacious for more severe invasive CMV syndromes such as pneumonia or gastrointestinal involvement. For severe CMV disease, the addition of hyperimmune CMV Ig may be beneficial, especially in bone marrow transplant recipients or patients with pneumonitis or gastrointestinal disease, although this is controversial (35,36). Foscarnet may also be used but is nephrotoxic and inconvenient to administer. It is used primarily when ganciclovir resistance is detected. Cidofovir is also nephrotoxic, although the nephrotoxicity can be ameliorated with the concomitant administration of probenecid (37). Preemptive therapy of CMV infection has been advocated for transplant recipients. A recent trial reported the “preemptive” use of low-dose intravenous ganciclovir for the prevention of CMV in high-risk CMV seropositive renal transplant recipients who received antilymphocyte therapy for induction or treatment of rejection (38). In our own study of preemptive therapy, patients were monitored intensively and intravenous ganciclovir was initiated based on a positive PCR or culture. This was compared with “deferred therapy,” in which patients were monitored intensively and treatment was initiated only upon development of symptomatic episodes and a positive culture or PCR. Deferred therapy was as effective in controlling CMV morbidity and mortality in renal transplant recipients but more cost-effective (29). Prophylactic therapy with intravenous Ig preparations such as hyperimmune CMV Ig (Cytogam) or standard pooled Ig has been used to control CMV infection but is associated with variable efficacy and significant expense (27,39,40,41,42). Of the intravenous Ig preparations, Cytogam (MedImmune, Gaithersburg, MD) is the only FDA-approved Ig preparation for prophylactic use in transplant recipients. Its approval is limited to the high-risk kidney group (D+/R-). In this group, prophylactic therapy does not prevent primary infection but reduces the incidence of serious disease. Pooled Ig preparations have also been used prophylactically for CMV and have been found to be similar to Cytogam in efficacy and cost (41). Cytogam and immune globulin may also be immunomodulatory and may reduce anti-HLA antibodies in sensitized patients (42,43). Our own data support that Cytogam can modulate T-cell responses against alloantigens (43). We recently showed that in vitro alloreactivity of peripheral blood lymphocytes obtained from five potential renal transplant recipients with high panel-reactive antibodies was inhibited by Cytogam in a dose-dependent manner ranging from 31 to 92% as indicated by mixed lymphocyte reaction. Cytotoxic T-lymphocyte activity against the alloantigens in all individuals assessed was also inhibited after in vivo administration of Cytogam 50 mg/kg × 1 dose. Three of five individuals experienced a decrease of 5 to 32% in the panel-reactive antibodies status at 4 wk after administration of Cytogam. Cytogam also blocked the anti-HLA antibody titers in a microlymphocytotoxicity assay. However, the major effect of hyperimmune globulin is to reduce the severity of the CMV disease, and it does not prevent infection. The cost for these preparations is high—often exceeding $10,000 for a standard 16-wk course of therapy. The risk of transmission of blood-borne disease by transfusion of human Ig preparations is minimal because of the purification processes involved. However, there have been rare reports of transmission of hepatitis B, hepatitis C, B19 parvovirus, and other viruses with pooled Ig but not Cytogam preparations. Furthermore, these therapies require intravenous administration with the attendant risk of line sepsis. They have been implicated in acute renal failure as well (44). High-dose oral acyclovir, 800 mg orally five times a day, initially was reported to prevent CMV disease in renal transplant patients (45). However, subsequent reports have shown that high-dose oral acyclovir does not prevent CMV disease in high-risk renal transplant recipients, and its use is associated with substantial cost and potential toxicity (46). Intravenous ganciclovir has been used effectively for prophylaxis of CMV in heart transplant patients and liver transplant recipients (47,48). Efficacy is dependent on the duration of therapy and as shown in liver patients, control of CMV required 100 d of intravenous therapy posttransplantation. The prolonged use of intravenous ganciclovir is associated with dose-limiting neutropenia and the risk of line-associated sepsis and complications of line placement. Recently, oral ganciclovir was used for the prophylaxis of CMV in solid organ transplant recipients. In our randomized trial of 42 renal transplant recipients who were at risk for CMV infection, oral ganciclovir was highly effective for the prevention of CMV infection and disease (49). In that study, ganciclovir 1000 mg orally three times a day (n = 19) for 12 wk after transplantation was compared with acyclovir 200 mg orally twice a day (n = 23) for the same 12-wk period given for herpes simplex prophylaxis. Important is that because the oral absorption of oral ganciclovir is low (7%), the ganciclovir dose was not reduced for renal insufficiency, leukopenia, or thrombocytopenia. PCR for CMV was performed on buffy-coat specimens, weekly for 15 wk and at months 5 and 6. During prophylaxis, none of the ganciclovir patients experienced CMV disease versus 61% of the acyclovir group (P < 0.0061). By 6 mo, 21% patients in the ganciclovir group experienced a total of five episodes versus 14 of 23 (61%) patients in the acyclovir group who experienced 18 episodes (P = 0.013 for patients; P = 0.026 for episodes). The time to development of CMV disease was also delayed by prophylactic oral ganciclovir (133 ± 17 d versus 51 ± 7 d; P < 0.0001). In the ganciclovir and acyclovir groups, respectively, 2 of 19 (11%) versus 23 of 23 (100%) developed CMV viremia by PCR during the period of prophylaxis (P < 0.0001). After discontinuing oral ganciclovir, 11 of 19 (58%) additional patients in the ganciclovir group subsequently developed PCR evidence for CMV viremia. Thus, 13 of 19 (68%) in the ganciclovir group versus 23 of 23 (100%) in the acyclovir group had evidence for CMV viremia by PCR at any time during the study (P = 0.005). However, more than two thirds of those with viremia after the prophylaxis periods did not require specific antiviral therapy. Similar results have been noted in a prospective study of 101 high-risk renal transplant recipients who were randomly assigned to prophylactic therapy with oral ganciclovir or acyclovir in addition to other agents (50). At a mean follow-up of 14 mo, the infection rates after 3 mo of therapy with ganciclovir versus acyclovir were 54 versus 0% for D+/R- patients, respectively (P = 0.0008); 43 versus 7% for D+/R+ patients (P = 0.01); and 8 versus 0% of D-/R+ (P = NS). PCR was not used for detection or monitoring in that study. The same beneficial effect of oral ganciclovir was seen in a multicenter, multinational, randomized, double-blind study in liver patients (51). In that study, the 6-mo incidence of CMV disease was 18.9% in the placebo group, compared with 4.8% in the ganciclovir group (P < 0.001). Furthermore, 25% of the patients who developed CMV disease in the placebo group died, whereas no one who developed CMV disease in the oral ganciclovir group died. Similar to the renal study, oral ganciclovir also reduced the incidence of CMV infection as measured by culture, shell vial, or antigenemia (placebo, 51.5%; ganciclovir, 24.5%; P < 0.001). PCR was not used in that study as well. In the renal study in which control patients received low-dose acyclovir, no patient in either group developed herpes simplex infections. In the liver study, oral ganciclovir reduced symptomatic herpes simplex infections compared with the placebo control. It is important to note that herpes simplex infections were controlled with oral ganciclovir in both studies, thus abrogating the need for dual therapy with ganciclovir and acyclovir. Studies of foscarnet prophylaxis have not been conducted. Foscarnet requires intravenous administration and is not a suitable prophylactic agent because of its significant nephrotoxicity. It is renally excreted, and reports of administration on dialysis are limited (52). Cidofovir has not been used for prophylaxis in renal transplantation. Cidofovir has a long halflife, is nephrotoxic, and is also renally excreted. Valacyclovir has recently been shown to help prevent CMV disease among high-risk renal transplant patients. Valacyclovir is a valine-substituted formulation of acyclovir that increases oral absorption by nearly 10-fold and markedly increases circulating levels of acyclovir compared with the unmodified formulation. In a multicenter prospective study, 408 CMV-seropositive renal allograft recipients for whom the donor was either seropositive or seronegative and 208 CMV-seronegative recipients of a renal allograft from a positive donor (D+/R-) were randomized to valacyclovir (2 g four times daily) or placebo (53). At 6 mo, valacyclovir significantly reduced the incidence of disease among both seronegative (16 versus 45% for placebo) and seropositive recipients (1 versus 6%). Remarkably, use of valacyclovir was also associated with a decreased incidence of biopsy-proven acute rejection among seronegative patients (26 versus 52% versus placebo; P = 0.001). Because acyclovir (even in high concentrations) has limited activity against CMV in vitro, the mechanism of action for these surprising results remains unclear. Although promising, further study is required to assess properly the role for valacyclovir in this setting. Valganciclovir is a valyl-ester prodrug of oral ganciclovir, which is in Phase III trials in solid-organ transplant recipients. It has a bioavailability of nearly 70% (compared with 7% for oral ganciclovir) and at doses of 450 to 900 mg produces ganciclovir levels that are similar to intravenous administration of ganciclovir at 2.5 to 5 mg/kg (54). Vaccination of renal transplant recipients with live attenuated vaccines from the Towne and Toledo strains of CMV has been reported (55). This did not prevent disease but did reduce severity of disease. Vaccines that are under development focus on administration of administering a subunit vaccine composed of gB (56). An exciting new possible therapy capitalizes on the fact that infectious virons require proteolytic maturation at a furin site (7). Recently, a highly potent and selective inhibitor of furin was engineered by construction of a variant of α1-antitrypsin, named α1-PDX (7). It results in a complete block of the furin-dependent processing of CMV gB and the mislocalization of this envelope protein. It has no obvious toxicity in culture and is 10-fold more effective than foscarnet in cell-culture models. As with treatment of any infectious agent, the risk of selecting out for resistance is of concern. Resistance to ganciclovir was first seen in AIDS patients in 1989, and it is this population in which resistance has been seen most frequently (57,58). Fortunately, drug resistance in transplant patients has been relatively rare. Most cases have been in lung transplant recipients (59). One case was reported in a renal transplant patient after treatment with intravenous ganciclovir for CMV disease followed by a course of oral ganciclovir (60). The resistance occurred on a maintenance immunosuppressive regimen of mycophenolate mofetil and resolved with discontinuation of mycophenolate mofetil and a short course of intravenous ganciclovir. One liver transplant patient developed resistance and was converted from intravenous to oral ganciclovir despite the presence of ongoing antigenemia (61). Although blood levels were not monitored, it is probable that the patient experienced low blood levels in the face of active viral replication. This is particularly likely to occur with oral ganciclovir. Indeed, a small pharmacokinetic study of oral ganciclovir in transplant patients recommended use of higher doses than those recommended in the product package insert—especially in the face of renal insufficiency (62). Most of the resistance has been related to specific mutations in the open reading frames of the UL97 (phosphotransferase) gene and the UL54 (DNA polymerase) (58). Alterations in the UL97 gene confer ganciclovir resistance by impairing the processing of ganciclovir to its triphosphorylated form, which is active on the DNA polymerase. Lack of phosphorylation, however, seems to be the most frequent mechanism of resistance in vivo. Thus, most ganciclovir-resistant CMV strains are susceptible to the pyrophosphate analogue foscarnet, which does not require activation and blocks the viral DNA polymerase by a noncompetitive mechanism (63). However, CMV strains with multiple resistance to ganciclovir and other antiviral drugs have been described. CMV continues to be a common cause of morbidity and mortality in transplant recipients. It has shifted from being overtly to insidiously lethal. The wide incidence of reported CMV infection and disease probably reflects differing programs' immunosuppressive strategies, ability to monitor for CMV, ability to perform the most appropriate diagnostic tests, and ability to recognize the more subtle presentations of CMV. Even with effective prophylactic, preemptive, and treatment strategies for CMV, CMV continues to be the most concerning viral agent in transplant recipients. The Holy Grail of CMV lies in developing effective vaccination programs rather than developing safer and convenient drugs to battle CMV and the emerging problem of resistance to the current antiviral agents. I thank Dr. Gregory Storch for careful review and Kimberly Knolhoff for careful preparation of the manuscript.